Beautiful and exciting as it may be, there’s much more to Brazil than the beach at Ipanema. 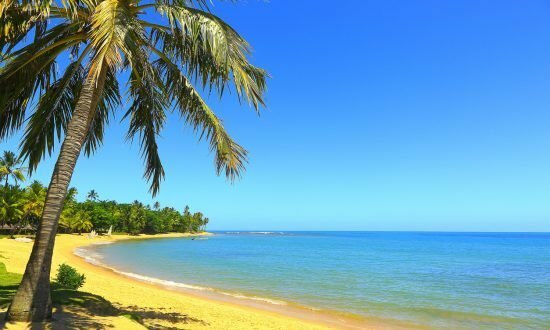 Travelers hunting for the ultimate paradise can travel to Brazil’s famous Costa Verde (Green Coast) region. At the heart of the Green Coast is the colonial port city of Angra dos Reis – the Bay of Kings. Request a free Quick Quote for Brazil today! Located south of Rio de Janeiro City, Angra’s vast bay features 365 lush islands—one for every day of the year—with more than 2,000 spectacular beaches. Some islands are private playgrounds for the wealthy, supermodels and media companies, but many are pure testaments to nature. 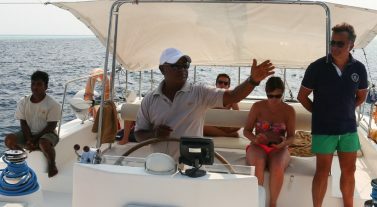 Superb snorkeling, diving, and hiking, water sports, fishing, and cruising can be done throughout the region. 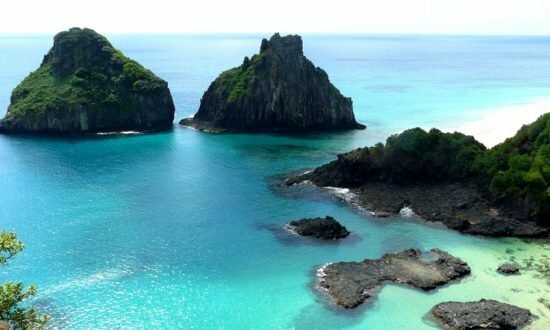 Whether you’d rather find ecological treasures in national parks or go clubbing in exclusive bars, there’s something for everyone on Brazil’s Green Coast. The city of Paraty is a National Historical Patrimony, meaning it preserves its countless natural wonders and architectural heritage. Founded in 1667, Paraty enjoyed great economic importance due to its sugar mills and plantations. As a bustling port, it saw plenty of gold and precious stones find their way back to Portugal over the years. Today, Paraty is well known for its charming old city with artisans, restaurants, music, culture and, of course, outstanding natural beauty. To enter Brazil, British, Canadian, Australian, American and EU nationals must present a passport valid for at least 6 months from date of entry. Brazilians with dual nationality must enter and leave the country on their Brazilian passport. Travelers must have a return ticket in their possession as well as proof of sufficient funds to cover their stay. Canadian, Australian and American nationals must obtain a visa. Visas are not required for British and EU nationals who stay less than 90 days. To determine whether you will need a visa, contact the nearest Brazilian embassy or consulate. Various types of visas are available for travelers. Children under 18 years old and their parents should carefully review Brazil’s visa application requirements. The adjudicating official at the Brazilian embassy or consulate may require a birth certificate and notarized travel authorization from both parents to issue a visa to a minor. Foreign travelers to Brazil must complete an immigration form upon arrival. This form will be stamped and handed back to you by immigration officials at the airport. You must retain this form and present it to immigration officials when you leave the country. According to the Brazilian embassy’s website, visitors who lose this form will have to obtain clearance from Brazil’s federal police to leave the country and may have to pay a fine. Medical Care: Medical care is generally good in the major cities, but its quality may vary. Especially in rural or remote areas, medical resources are not equivalent to those of western/developed nations. Dengue fever, yellow fever and malaria are found in Brazil and spread by mosquitoes. The use of mosquito repellent is very important to prevent Dengue fever especially in the summer months. The southeast region does not have cases of yellow fever and malaria; these are prevalent in the Amazon region (north). Schistosomiasis (aka Bilharzia, transmitted by parasitic worms), hepatitis A and B, tuberculosis, and rabies are present in Brazil. Vaccinations: For adults, none are required for entry unless you live in or have recently traveled in a country where yellow fever is present. For children ages 3 months to 7 years, a polio vaccination certificate is required. Travelers should consult their physician 4 to 8 weeks before departure because some vaccines and malaria prophylaxis must be given several weeks before arriving in Brazil. Vaccinations for typhoid, hepatitis A, diphtheria, and tetanus are recommended. Food and drink restrictions: Tap water should not be consumed unless it has been boiled or otherwise sterilized. Avoid ice cubes as well. Bottled water is the safest option. Pasteurized milk is quite common and easy to find in any market, even at the small ones. Meats and fish should be well cooked. Vegetables also should be cooked, and fruit should be peeled. Timekeeping is very flexible in Brazil. Arriving 30 minutes later than scheduled is typical and socially acceptable. Though Brazilians’ love of skimpy beachwear is well-known, going shirtless or wearing abbreviated attire anyplace other than the beach isn’t considered polite. No tipping is expected on top of the 10% service charge on restaurant bills. Though illegal drugs are prevalent, remember that Brazil’s penalties for drug possession or trafficking are among the harshest in the world. Credit Cards: Visa and other international credit cards. In Angra dos Reis and Paraty credit card use is more difficult, especially in Ilha Grande. Carrying pocket money is recommended. ATMs: Yes. There are a few ATMs close to the base. However, once on charter, it’s more difficult find ATMs. Obtaining money at the airport or at one of the main banking centers (in Rio de Janeiro or Sao Paulo) is recommended. Credit cards often provide the best exchange rates (check with your bank to learn its exchange policies and prices). However, better prices for goods may be offered if you pay in cash—up to a 15% discount. Tourists are allowed to bring in clothing and goods for personal use, including one radio, one tape/CD player, one typewriter, one notebook computer, one film/video camera and one still camera. The value limit for gifts and other merchandise you can bring into Brazil duty free is $500 (U.S. dollars)—either brought from home or purchased at a duty-free shop outside Brazil. Goods purchased at a duty-free shop inside Brazil have few restrictions. However, if you fail to declare gifts or other merchandise exceeding the $500 limit, you will pay a 50% regular duty plus a 25% penalty. Presenting the original purchase receipts for such items may reduce the duty somewhat—especially if you bought the item on sale. If you wish to bring in or leave the country with amounts higher than R$10,000, or the equivalent in another currency, you must declare it. Brazilian customs authorities may strictly enforce regulations for the temporary importation into or export from Brazil items including firearms, antiquities, mineral samples, tropical plants, medications and business equipment. People attempting to export biological material without proper permits run the risk of being accused of “biopiracy,” a serious offense in Brazil. Airports: The nearest international airport is Rio de Janeiro-Galeão International Airport. There is only charter air service between Angra dos Reis and Rio de Janeiro. Most visitors go by land (car or bus); it takes approximately 2.0 to 2.5 hours to travel from Rio de Janeiro (along road BR-101) to Angra dos Reis. Private Shuttle: We work with a trusted partner, Cesar Tour, that uses cars with a capacity of up to 4 passengers each and vans with a capacity of up 10 passengers each. Upon request, our commercial team will schedule transfers for clients. However, clients are responsible for paying the driver directly, at the time of service, in local currency. Some of our frequent clients contact Cesar Tour directly, but we recommend allowing our commercial team to arrange the transfers in order to follow up. CPTEC is an official meteorological source where you will find a variety of maps on Brazil and its regions (north, northeast, south, southeast). WINDGURU is commonly used for spot forecasts. Type in “Angra dos Reis,” and it will give you general wind, sea and other local weather conditions. Summer: November–March (precipitation is at its highest). Winter: June–August. The average annual temperature is around 23°C (74°F), with an average annual high of 30°C (86°F) and an average annual low of 18°C (64°F). The climate in winter is comparable to summer in northern Europe. 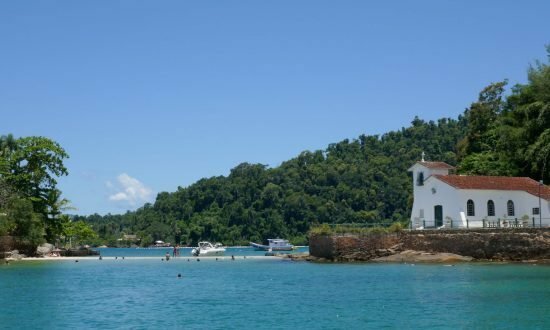 In general, sailing conditions in Angra dos Reis and Paraty are very quiet and do not experience major changes during the year. 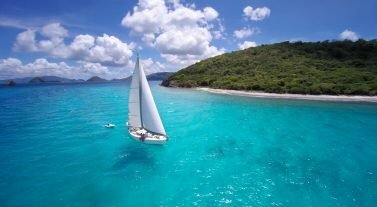 The prevailing wind is from the east with light breezes ranging from 8 to 14 knots, with flat seas without strong currents or significant tide variations, reaching maximum 1.20 m (4 ft). In the warmer months (November–March), summer afternoon rainstorms are isolated, quick and fleeting with wind gusts reaching up to 25 knots but without significant change in the wave conditions. Winter cold fronts come from the southwest, and usually the wind (of up to 25 knots) subsides after the first day. The cruising area comprises Ilha Grande Bay, the bay of Angra dos Reis, Paraty and Paraty Mirim. 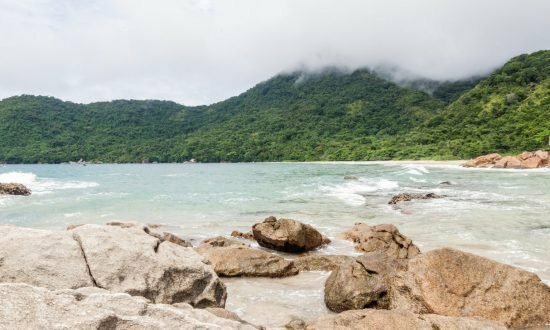 The wildest part of the area is outside of Ilha Grande, which has the most amazing white-sand beaches. On this side of the island, there is no mobile phone coverage. Regarding overnight anchorages, the cruising area has many sheltered bays. There are few marinas that charge for docking. Before anchoring inside the bays, visitors must check the weather forecast conditions as, depending on the time of year, some of them may be subject to strong southwesterly winds. All of the above conditions are fairly predictable when using the recommended forecast sources. However, due to the mountainous geography and the vast rainforest canopy, weather conditions in nearby areas may vary significantly. Day 1: Cruise from our base to the overnight anchorage at Abraão, which means “bay,” in old Portuguese. Dine on local seafood at one of the many wonderful restaurants. Day 2: Cruise to Enseada de Palmas and explore the trail to the idyllic beach of Lopes Mendes – #1 on the island. Eat dinner and stay overnight at protected inlet Saco do Céu. Day 3: Visit the chapel of Freguesia do Santana, then head over to Lagoa Verde for snorkeling. Stop for refreshments at the floating bar, then enjoy an overnight stay at Sítio Forte. Day 4: Sail to Enseada do Pouso, where a gorgeous waterfall is only a 10-minute stroll away. Then, it’s off to the historic Paraty village and its exquisite dining options. Day 5: Visit the stores in the historic downtown before heading off to Mamanguá, where there are excellent walking trails, stunning beaches, and perfect lunch spots. Spend the night at Ilha da Cotia, at Paraty-Mirim. Day 6: Enjoy another pleasant sail back to Angra dos Reis. Arrive at Praia do Dentista to swim around the floating bars for snacks and drinks. Head to Porto do Frade to have a leisurely dinner and spend the night. Day 7: Explore Itanhanga Island and Botinas Island, and end the day with a visit to Bananal cove – the perfect final stop on an unforgettable adventure. Airport: The nearest international airport is Rio de Janeiro-Galeão International Airport. There is only charter air service between Angra dos Reis and Rio de Janeiro. 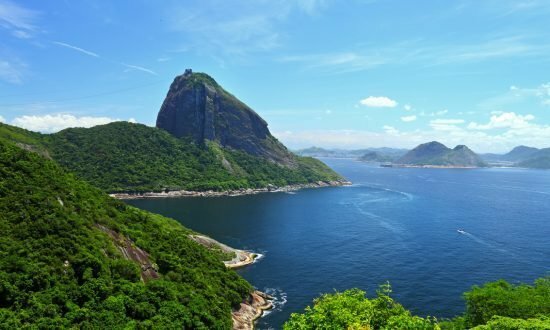 Most visitors go by land (car or bus); it takes approximately 2.0 to 2.5 hours to travel from Rio de Janeiro (along road BR-101) to Angra dos Reis. Private shuttles: We work with a trusted partner, Cesar Tour, that uses cars with a capacity of up to 4 passengers each and vans with a capacity of up 10 passengers each. Upon request, our commercial team will schedule transfers for clients. However, clients are responsible for paying the driver directly at the time of service in local currency. Some of our frequent clients contact Cesar Tour directly, but we recommend allowing our commercial team to arrange the transfers in order to follow up. Credit Cards: Visa and other international credit cards. In Angra dos Reis and Paraty credit card use is more difficult, especially in Ilha Grande. Carrying pocket money is recommended. ATMs: There are a few ATMs close to the base. However, once on charter, it’s more difficult find ATMs. Obtaining money at the airport or at one of the main banking centers (in Rio de Janeiro or Sao Paulo) is recommended.